So I was nominated by Vicky at around & around & upside down for the Liebster Award. It is an award for bloggers with less than 200 followers on bloglovin. 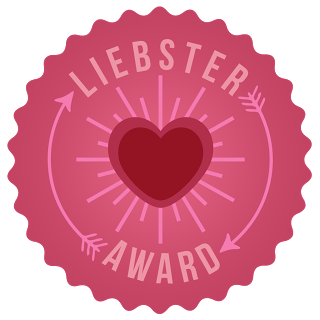 The Liebster award is one of those things that is really more a meme than an award but I thought that it might be nice to see out the year by doing the meme anyway. Plus, I am really flattered to have been nominated. There are a few 'rules' to follow. I need to do 11 facts about me, answer 11 questions & then (depending on the version of the meme) nominate 3-15 other blogs with less than 200 followers on bloglovin'. So 11 random facts about me - not ones that I did in the 50 random things about me post. Apparently when I was 2 I described someone as having "a face like an armadillo with hairs on it". I met the Archbishop of York - he came to my school. I am going to the world con in London with my brother. I used to be in the Leeds Youth Council. I spoke in the House of Lords (youth debate). I have done Stage Dance, Tap Dance, Modern Dance, Street Dance, Bollywood Dancing & I did dance competitions. I have had memories of flying that are so vivid I would swear they actually happened. I love France as a country, it is just awesome. My favourite ever computer game is Simon the Sorcerer (one & two) because my brother & I used to play them when we were kids & despite being click & point they have awesome storylines & they are really REALLY funny. I went through a phase where all I watched was Rom-Coms. 1. If you were an animal, what would you be any why? I'm not sure, I think I'd like to be something that could fly - like a hawk or some kind of sea eagle. 2. If you could jet off to anywhere in the world and money was no object, where would it be and why? Paris & then never come back. Paris is my favourite place in the whole wide world & I the last time I was there my depression was so bad that I wasn't really compos mentis & I remember very little of it. 3. Do you prefer your own company, or to be surrounded by people? I struggle not to be surrounded with people - I feel kind of lost when I'm by myself. 4. Are you OCD neat, a total slob, or somewhere in between when it comes to housework? Somewhere in between - I like things to be clean & have some semblance of organisation - although I struggle to do house work except in tiny bits. 5. Who is your fave celeb for a) fancying b) emulating their style and c) wanting to disappear of the face of the planet? I guess if I had to pick - a) Dean Winchester b) I would have to say either Kirsten Bell or Kate Middleton c) Justin Bieber - not because I'm a hater (I'm sure he is a perfectly competent musician) I just cannot approve of the way he behaves. Both, I have huge respect for the intelligence of cats but dogs are friendly & a lot of fun. 9. As a kid, what did you want to be when you grew up? How close are you now? I never had a jobs that I wanted to do, I wanted to go to Oxford & do a degree. I got an offer - twice but I've been too ill to go to uni. So, very close & very very far. 10. What did you study at college? I did A-levels at 6th form & I studied Philosophy & Ethics, Maths, Further Maths, History & Psychology. 11. Do you prefer a quiet night in, or a night out partying? For my health - a quiet night in, for me - I'd love a night out partying, I've never experienced it. Bonus: Alexandra of Into the Woods (with slightly over 200 followers she isn't eligible but it felt weird doing this without nominating her, her blog is STUNNING). Favourite blog you can't nominate? What is the best bit of blogging? What is the best experience you have had, because of blogging? Is there anyone that you wouldn't want to find out about your blog? What do you think is the best post you've ever done? What is the post that got the best response?